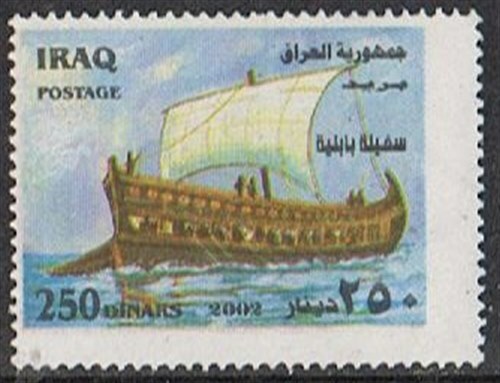 The other two stamp show what I believe ships used by the Phoenician people, there was shipbuilding in that time in Mesopotamia, and it is known that Phoenician ships made trading voyages to Mesopotamian ports. The 500 D shows a Phoenician trading ship of which Wikipedia give. The Greeks had two names for Phoenician trading ships: hippoi and galloi. Galloi means tubs and hippoi means horses. 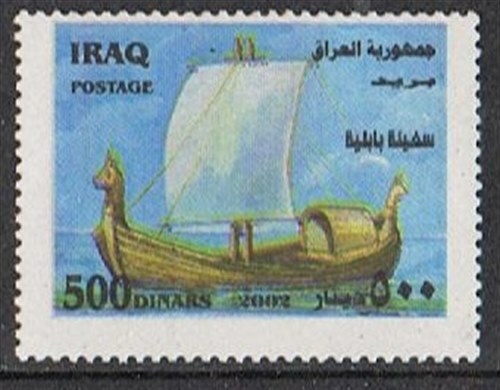 These names are readily explained by depictions of Phoenician ships in the palaces of Assyrian kings at Khorsabad, northern Iraq from the 7th and 8th centuries, as the ships in these images are tub shaped (galloi) and have horse heads (hippoi). on the bow and mostly a fish tail on the stern It is possible that these hippoi come from Phoenician connections with the Greek god Poseidon equated with the Semitic God "Yam". The average capacity was between 100 and 500 tons. Length 16 -30m, beam 4 -7m, and a draught of about 1.5m. Did have a bipod mast with a square sail. Iraq 2002 150/500D sg?, scott?